Several people have recently commented that our life aboard Low Flite looks amazing…and it usually is. We experience fabulous sunsets, swim & snorkel off the back of our boat, hop in our dinghy and explore remote beaches, and when we get bored with all that, we can move to a new location and start all over again. Yes, it’s pretty cool. But I thought people might also appreciate learning about the less fun aspects of living on a boat. Where should I start…how about with the constant need to watch how much water we consume….and on land I used to consume (read waste) a lot of water! This has been a HUGE adjustment for me. No more 10 minute showers, and my hair only gets washed about twice a week. Even washing my hands, which I do a hundred times a day, consumes a significant amount of water, not to mention doing laundry, washing dishes, cleaning, etc. We are very fortunate to have a Spectra watermaker on board and two 103 gallon tanks, however we usually have to run the noisy generator (since we haven’t had much sun) and we also should be in clear, clean water to use the watermaker. So water is available but is a valuable commodity that has to be watched closely. Another fact of living on a boat is that salt water creates rust on almost any surface pretty much instantaneously. Since most of our surfaces are white, the rust streaks stand out like a sore thumb. Keeping the rust at bay requires constant attention and lots of polishing, which is something we’re still getting used to. Everyone has their own favourite concoction for this work such as Sno Bol toilet bowl cleaner, The Works which is an off-brand (read: cheaper) toilet bowl cleaner, On and Off hull and bottom cleaner, Soft Scrub w/ bleach, CLR, etc. So far, The Works has been our rust remover of choice. On and Off is great stuff, but may be a bit too potent for what we need so far. Here’s John using the dinghy to reach some rusty screws on the rub rail along the outside of our hulls. Sailboats can go almost anywhere, but at about 6-7 knots per hour on average. So yes, we can move whenever we get bored but it takes us an entire day to move only 40 miles. 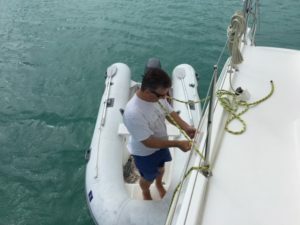 We need to ensure the weather is decent for moving, that the new location has a good anchorage (protection from wind and ocean swell), as well as a bottom suitable for holding the anchor. We also like to arrive at the new location to anchor before sundown. In the Bahamas, there are dozens of gorgeous beaches on each island, however not much elevation to offer good protection from the wind. Thankfully with the internet and experience from other cruisers, lots of info is available about good anchorages throughout the islands. The other aspect of moving to a different anchorage is proximity to amenities. We are enjoying our current location at Salt Pond, Long Island because there’s a well-stocked grocery store, convenient dingy docks, hardware stores, a couple restaurants, liquor store, local mechanic, laundry services, and garbage disposal. Some cruisers come here and stay for the entire winter, and it’s easy to see why. There is an active local community with lots to offer. We’re blessed to have come here but very few anchorages offer these services. Soooo…think about what it would be like on a small sailboat with no way to remove your garbage after a week or two. On a recent trip to the hardware store, I was happy the dock was only 1km away! Speaking of amenities, we stocked our cupboards in Florida with non-perishables before we left (thank you Costco), but we buy fresh produce as we go. In remote areas like Long Island they have very little agriculture, so residents rely on weekly mail boats from Nassau to supply fresh fruits, vegetables, dairy, etc. Currently there are 33 boats anchored in the bay. Everyone knows the day the boat arrives, and we all head to the one little grocery store, Hillside Supply, on the same afternoon to buy the limited fresh vegetables before they vanish. And they aren’t cheap! Tomatoes cost $2.55 US each (about $3.20 CAN each), apples are $1.45 each, avocados are $2.79, and a cucumber is $3.25. Salads are a luxury item! It’s been an interesting challenge to create nutritious and yummy meals with few fresh vegetables, and very limited fridge space. Many unpleasant parts of boat life are related to maintenance, or of problems that happen without timely maintenance. 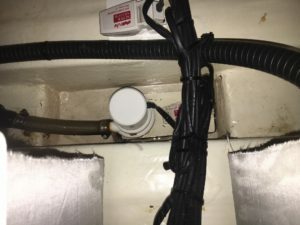 One of the things that can create a lot of issues on boats are the toilets, or “heads.” If not well-maintained they can quickly start to smell, and believe me, that is not something you want to permeate throughout the boat. There are pumps to bring water in, and macerator pumps to chop up and flush the waste out. All of this requires diligent maintenance and attention to ensure no leaks and everything flows as it should. One of our macerating pumps had already developed a crack and leaked and needed to be replaced. This allowed John to become very intimate with the inner workings of the toilet, and the “remains” of what the previous owners tried to flush through it! While toilet tales are always a delight, bilge work is probably what garners the most understanding looks from fellow boaters. Bilges are the lowest point in any boat, so all kinds of misery can exist there, waiting to be discovered. 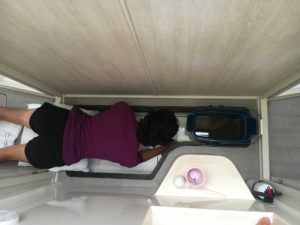 In the picture below, I’m laying on my stomach to reach as far as I can down into the bowels of the boat to clean the goo from the bilge…notice the colour of the water in the bucket – yuck! And an after shot to show what it looks like after cleaning for an hour. 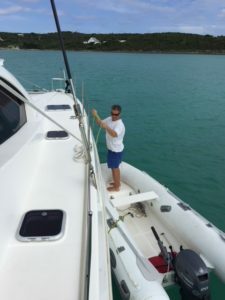 Did I mention we have a catamaran, so two sides that require a regular cleaning…needless to say there was no time to play on my paddleboard that day! 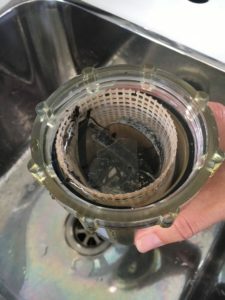 Maintenance of pump guards and filters has to be done every couple weeks to ensure nothing clogs the filters and restricts the water flow. 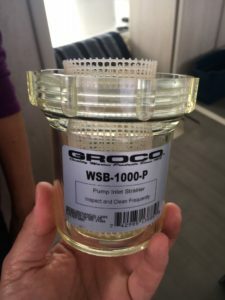 This one is the raw water strainer for the generator, and was pretty icky with sea weeds and particulate matter when I pulled it out. And the after picture, once it was cleaned. 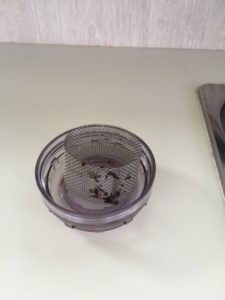 This pump guard strainer below was actually pretty clean but I gave it a good rinse anyway to remove the debris. Mildew on a boat can also be an issue. When it rains, it’s really tough to ventilate the boat so humidity builds quickly. We had a couple days of rain and high winds last week and the floors felt moist and sticky (and yes, they were pretty clean at the time). Once humidity gets into the mattress and bedding in the berths, it can become a real issue for mildew developing if it’s not aired out. We’re fortunate that we have a door to the front porch from our main salon which allows lots of air to flow through quickly. This helps keep the moisture concerns under control. Some of the other boaters in the bay were describing the humidity causing water to run down their walls. I’m glad we haven’t experienced that problem! Some of these items are routine/periodic maintenance and others are done as required when we see the need. To help us keep track, we developed a Preventative Maintenance Checklist that you can see along with other resources on our Downloads Page. We also keep a maintenance log where we detail all the work for future reference. This helps both our maintenance tracking and fault finding, as well as demonstrates to any potential buyers down the road that we were conscientious owners, and this can go a long way come negotiation time. Rope on tertiary claw anchor is too worn to be used safely. Removed and now will use as 120′ spare line. 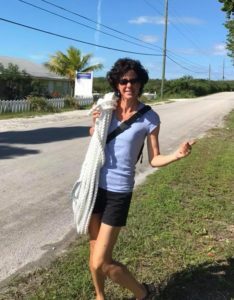 100′ 3-strand w/ thimble splice purchased from Craig at Seafarer Marine. Shackled and moused to claw anchor. Outer hull rust and rub marks greater reduce with Goo Gone and The Works. Christa used On and Off in some places on deck, but may be too harsh for our needs. Ruins toothbrush applicator after one use. Port hull rub rail missing 3 screws. All do not go thru the gasket and into the hull. Need #8 X 1/2″ for the short replacements. Cleaned all pump guards and strainers on port side. Shower pump guards smelled from lack of use. No smell from aft toilet likely from frequent use. Re-whipped secondary dinghy line, and the working end of the primary line. Lifted left side track of helm enclosure. The last 2 screws didn’t have a bead of silicone between them allowing water to run under the track and into the helm and beyond. Also cut a small piece of PVC to install in the same area similar to a shower guard. 5200 under both pieces. Cleaned engine compartment floors enough for Christa to stand in her bare feet. Did not clean out the engine bilges. Both engine raw water strainer covers removed with some motivation from a pry-bar handle and rubber mallet. Christa cleaned them enough to use with drinking water. Gasket and threads well lubricated with Vaseline and checked for leaks. Will monitor with more pressure while underway. Have you determined yet the average amount of time that you spend per week on maintenance? 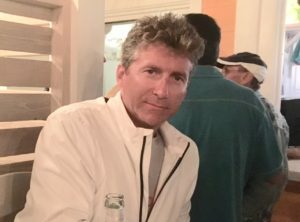 Hi Joe – we haven’t been on the boat long enough yet to have an average and we are still discovering what needs to be done & how frequently. We might go 4-5 days without doing anything and then do a full day. not lazy. Enjoyed our chat.